Friday, Friday, Friday! Random Five Friday! 1.) After a week of cold, sleet, snow, ice, and wind, today we’re having……rain and wind. Yes, a mini “nor-easter”. Last night, as I listened to the strong winds, I was reminded of growing up in an old house with a tin roof. When the wind blew, the tin rattled so badly that, many times, Mom and I expected it to blow completely off, but, thankfully, it never did. And, surprisingly, I don’t recall that old roof ever leaking when it rained. 2.) In Gypsy news this week, she got a mani-pedi yesterday. (I trimmed her nails.) She found it totally relaxing. She’s such a girly girl. 3.) Earlier this week, I heard birds fluttering around outside one of the windows in our bedroom. Then I spotted Sundae up in the loft, “chattering” at them. She never jumped to the window sill (or attempted to), but she was as close to the edge as she could possibly be. 4.) I’m looking forward to an antiquing jaunt tomorrow with a friend and hoping “her” cupboard is still there….just waiting for her. The weather forecast sounds wonderful: partly cloudy and 62. 5.) Wednesday’s sunset….wintry looking, isn’t it? 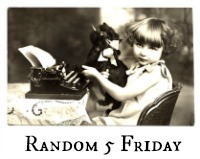 Linking up to Nancy’s Random Five Friday. This entry was posted in Days at Home, Family, Gypsy, Sundae, Sunrises/Sunsets and tagged calico cat, old house tin roof, random five friday, tabby cat, winter sunset. Bookmark the permalink. It certainly does look wintry looking. I’ve packed sweaters, turtlenecks, my carhart and boots for my trip back East. Still, I’m looking forward to the warmth of visiting family and friends. A great “random five” today! I’m glad Gypsy likes the mani-pedi thing – Sam “tolerates” it. Love the photo of Sundae in the loft contemplating the BIG jump. 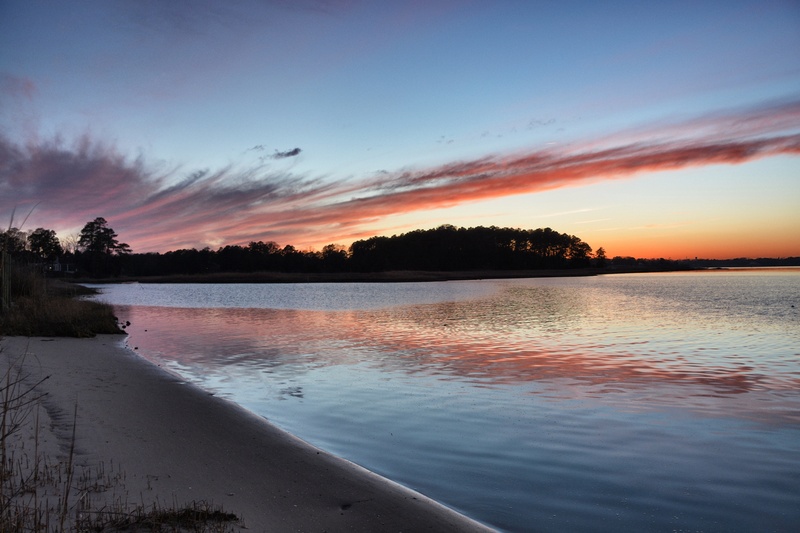 Your water views are always spectacular no matter WHAT time of the year it is! I wish BJ would enjoy getting a mani-pedi…well, a pedi anyway. But you’d think I was cutting off her paws if I tried to trim those back claws. Gypsy is so laid back! Beautiful Wednesday sunset and the picture of you and Gypsy is sweet. I am impressed she let you trim her nails! Now I have a picture of what your loft looks like.. 🙂 I remember asking you if you worried about Sundae jumping from the loft as Izzy did. Enjoy your Friday and Weekend Dianna! Glad you’re feeling better, Dianna! Enjoy your day out. gosh, that last photo… and just love your two girls! Your random fives are always fun! That photo of Sundae was priceless and yes, that sunset does look wintry. Spring is coming, spring is coming, spring is coming!! A great assortment, as usual! I can hear the rain on the little strip of flashing at the back of the house .. definitely heard it last night ! I’m glad Sundae didn’t try to make that jump ……..
Love Love the shot of Sundae and Jo-Jo won’t let me near her nails! Another great R5F! 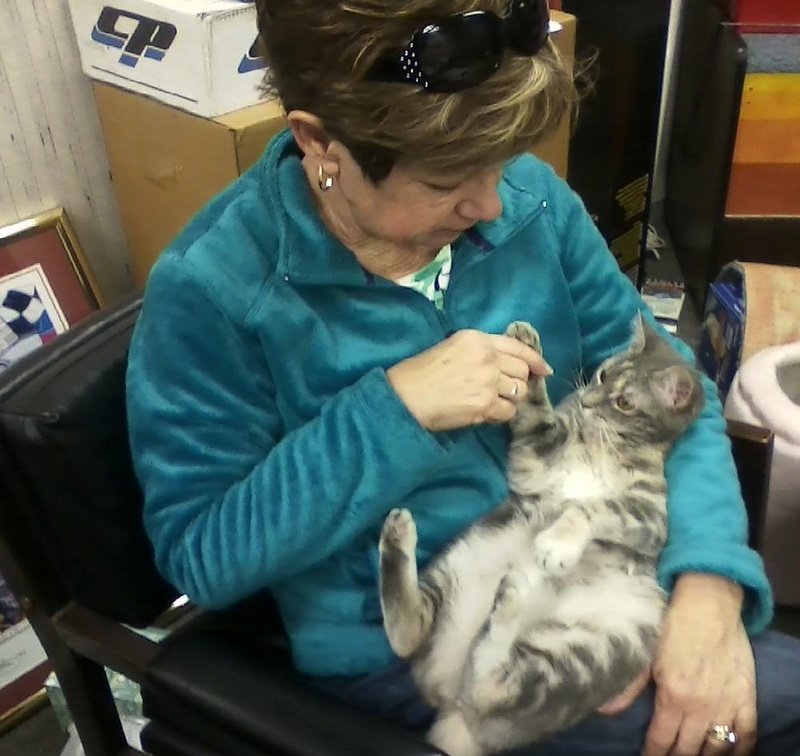 Gypsy is a sweetheart to let you trim her nails and Sundae looked like she was going to take off any minute. Have fun tomorrow. where are some of your favorite antique haunts ? I unexpectedly found a wonderful ladies dressing vanity at the Williamsburg Mall in January. My siblings got together for an antiquing adventure on our mother’s birthday. The little piece I found matches my mother’s old bedroom suite! But it is also very, very similar to a federal sideboard that I have, so the little piece is now living in my dining room. That day was like today, weather-wise: blowing rain, cold to the bones. But it was a fun day. Good luck, may you find unexpected treasure! Oh, we love the Williamsburg Antique Mall! It’s about time for another trip there. Tomorrow we’re going to Country Harvest Antiques in Spring Grove. Tiny little shop, only open one day a month, but we usually find a little something to buy! Sundae would love a perch to enhance her bird-watching. The sunset image was superb. Never have I seen one quite like that. Not going to see one today. But what a nice day to sit out on the back porch and edit. C.
What a gorgeous stair case! I don’t know how a cat could ever resist that perch. I live in a house with vinyl siding at present and I’ve never heard anything that’s so loud in the wind. Sounds like the house is going to fall over. It’s a wonderful advertisement for brick! That sunset is gorgeous. It seems the sunsets with this horrible winter have been prettier than usual. Or maybe I’m just so depressed about the weather that I appreciate the beauty more! Enjoy your weekend! I love the picture of Sundae. Sorry to hear you were sick. The wind was a blowing at the beach today and the ocean was wild! Glad to be home and looking forward to some spring weather! She is so a good girl to be relax during nails cut. Malus never relax and hates nail cutting!!!! Wonderful random 5 and fantastic pics! Sorry you didn’t feel well this week, hope you are all better now. Gypsy is adorable in her Pic this week!!!! Happy Friday! Happy Antiquing tomorrow! Loved visiting . . . cute, appreciative, trusting pedi lover . . .
An antiquing adventure sounds delightful. We got 7.5+ inches of snow out of Friday’s storm. (I stopped measuring). Then Sat. temps soared into 60’s. Wow. Talk about fluctuating weather patterns. Great pictures! I’m amazed that Gypsy found her mani-pedi relaxing. Oh that sunset is lovely. Gypsy and Sundae are such sweet cats. Don’t they look funny when they are watching birds. Weather here is rainy this week but warm so that’s a plus. I grew up in a house with a tin roof. I still miss being sung to sleep by the rain drops dancing on it. I do agree though that during winds or thunderstorms it was a bit unsettling, but amazingly the tin roof held on. Your baby girls are so pretty and delightful hearts of joy to see. Gypsy must be a really good-natured gal to tolerate nail trimming. What a sweetheart she is. Sundae is a good hunter to tree them birds outside the window. She has great balance too to stay perch so tight on the edge. She’s so cute. I’ve heard the rain on a tin roof, but not wind. Rain by itself is nice. 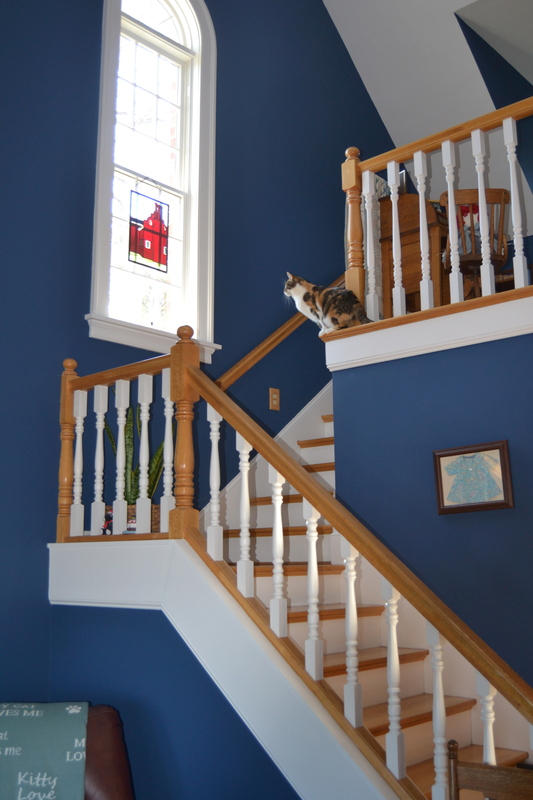 Sundae looks great with her coloring against the colors of your staircase. Love how she’s leaning as far as possible toward the window.